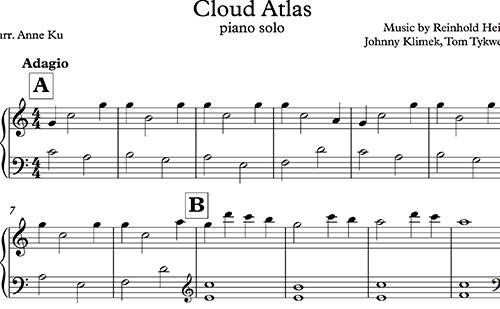 The piano theme from Cloud Atlas is haunting and beautiful. While there are many versions arranged by piano fans, I have yet to find one for easy piano. Here is an attempt. Work in progress. The melody of the movie Cloud Atlas (2012) is so haunting that it’s possible to loop it in a forever trance. It’s much slower than I had thought when I first sightread it. Not having seen the movie, I’m only guessing that the motif is the common thread throughout. Here’s a 30 minute version that can be used as background music or for meditation. I first heard of the book when I was queuing to meet the author David Mitchell in Amsterdam. I waited patiently among strangers. He chatted with me and signed the book. I felt compelled to read it and write a short review. It was by no means an easy read but the way he constructed the twisting plot fascinated me. I knew that the composer and his music was very important in the story but to actually get such work composed for the movie was another matter, definitely an ambitious feat. Thank you so much for your Free Easy Piano Contemporary Music! Very nice arrangement for any beginners!